Just days after the White House budget director issued a memo requiring Trump Cabinet officials to ease up on taxpayer-funded air travel, more developments unfolded to suggest that the controversy is apt to continue. Amidst Friday’s drama that brought the forced resignation of Health and Human Services Secretary Tom Price for his use of private charter flights, Interior Secretary Ryan Zinke announced that he had taken three charter flights since March, including a $12,375 trip in June from Las Vegas to his home state of Montana. On Monday, Politico disclosed that the private jet travels of Education Secretary Betsy DeVos may cost the taxpayers as much as $6.5 million over the next year. Though DeVos pays for the flights from her family fortune, Education has an unusual security arrangement with the U.S. Marshals Service. 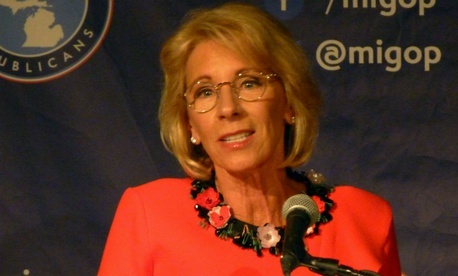 Documents obtained under the Freedom of Information Act and comments from an Education Department spokeswoman showed that DeVos and the Marshals Service had renewed the arrangement for fiscal 2018. The department stated that the set-up, which includes a limo, other vehicles and per diems for the security personnel, has already been shown to save money. Previous Education secretaries relied on the department’s own security services. Government Executive’s own FOIA request to the Marshals Service on DeVos’s specific arrangements, filed in July, is pending. The HHS inspector general confirmed to Government Executive on Monday that the IG’s probe of the use of private charter planes at taxpayer expense by the now-dismissed Price will continue. Queries to HHS on whether Price actually wrote his promised check to the Treasury for $51,887.31 were not acknowledged—and on Monday, White House press secretary Sarah Huckabee Sanders declined to comment on the question. Republicans in the House in 2012 advanced bills to crack down on agency travel following a scandal over lavish spending at a General Services Administration training conference in Las Vegas. The Obama administration OMB proceeded to discourage excess travel spending as well.